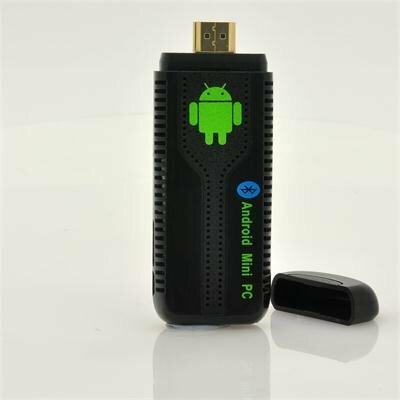 Successfully Added Android 4.1 Mini PC "Key II"- 1.2GHz Dual Core CPU, Bluetooth 3.0, 8GB Memory to your Shopping Cart. 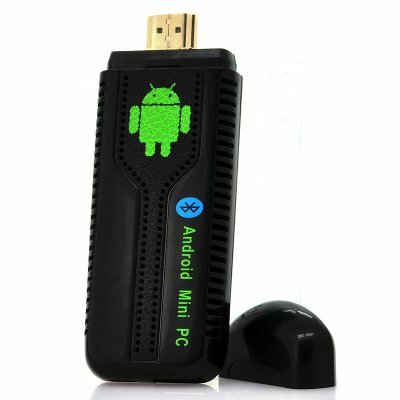 Android 4.1 Mini PC with HDMI, 1.2 GHz Dual Core CPU, 1GB RAM, Bluetooth 3.0 and Wi-Fi. Turn your HD TV into a fast Android 4.1 SmartTV allowing you to browse the web, download apps, write emails, watch YouTube and much more! The “Key II” Android Smart TV stick comes with Bluetooth 3.0 allowing super faster data transfer speed and x2 USB ports for the ability to connect such devices as a wireless mouse and keyboard both at the same time! Instantly turning your HD TV into an Android 4.1 powered PC, simply connect it to the HDMI port of your TV and you’re all set. Experience the power of a SmartTV at just a fraction of the cost! And you won't even have to replace your current TV set! Powered by a 1.2GHz Dual Core CPU and 1GB RAM, the “Key II” can easily run all your favorite apps, even while multitasking! Supporting 1080p HD video playback you will be able to enjoy your movies in crystal clear resolution and thanks to the 8GB of internal memory and a Micro SD card slot your Android Stick will never run out of memory again! Use the Bluetooth function to connect a Bluetooth keyboard and mouse or transfer files from your cell phone or Bluetooth enabled PC. Thanks to the fast Wi-Fi receiver, you’ll be able to reach high internet speeds, making surfing the web faster than it has ever been. Running on Android’s great OS, Android 4.1 Jelly Bean, you will have access to more than 700.000 apps directly from the Google Play store and the very intuitive user interface makes using this Smart TV dongle a real delight. On top of that, a HDMI extension cable is provided, allowing you to easily install the “Key II”. With the Android 4.1 Smart PC "Key II", you’ll have even more options to entertain yourself and your guests at home using your HD TV. Offered at a low wholesale price, this item is now in stock and available for single or bulk purchase. Buy now and it ships out within one day. Brought to you by the leader in wholesale android media players, Chinavasion. Works fine with all my tv's.Easy to install and to handle it.i connected mouse and a keyboard and work fine.